A little blog comment I wrote is making the rounds. "Pretty Good Lutherans" posted on the interchange with David Housholder I wrote about in my last post. Pretty cool. Check it out. Ok, so I once again posted a comment to another blog that really could have been a blog post of its own. The blog post in question is entitled "Why Lutherans Can't Evangelize" by David Housholder. Here's the link to his original post, and here is my reply. I find a lot in this that is really helpful, and a lot that I think is not so helpful (kind of a both/and thing for me). I’ll start with the good news. This has been the functional Lutheran missiology in America for several hundred years, and actually, its worked well enough for us. But its just plain not working anymore. It worked in an era where people stayed close to home, had strong family and ethnic ties, and lived in a culture that assumed church participation for all (upstanding) citizens. That’s a world we don’t live in anymore. And so we’ve dropped the ball on mission and pretended that this will keep working. Let’s face it Lutherans, I know we think the young people we confirmed will be coming back once they have kids, the reality is that many of them have grandkids now, and at some point we need to figure out what we are going to do now. While Lutherans may not have a functional eschatology that fits into current evangelical/pentecostal frameworks I find it hard to support the claim that we have no eschatology at all. Are we thinking all the time about being raptured up in the air? Hardly. But there is much more to eschatology that that. I’m a fan of a Pannenberg style proleptic understanding of eschatology–which I think makes the kind of sense to the people you are wanting to proclaim the gospel to. God created the end first, and draws us towards that ultimate fulfillment. Jesus is the presence of that future reality in our midst, and the cross becomes the “hinge point” moment where this is realized fully for all time. The whole world has already been reconciled to God (proleptically) in Jesus. It’s just taking the whole world a while to realize that and live accordingly. I, for one, am trying to live that all out now because it works better than not. So I follow Jesus. Its not that “accepting Jesus” gets me a “get out of jail free” card or extra points towards that prize (or that the trapdoor opens at the pearly gates if I haven’t done it in time) its just that the Jesus revealed something true about the universe–that it has been reconciled to God already. So why aren’t we living accordingly? And living in this reality, following Jesus, is not only good for me, its good for my neighbor whom I am now free to serve because I know how this movie turns out. Doesn’t get much more Lutheran than that. I think Luther wasn’t so worried about the end times because either a) we are in them now or b) they we are not and they’ll come later. And really, what difference would it make. Plant your tree, live your life, love your neighbor. I tend to think Luther’s Antichrist stuff about the pope was more for dramatic effect (he was already under threat penalty of death by the pope, so he might as well go for broke). And I think he got kind of pissed off. 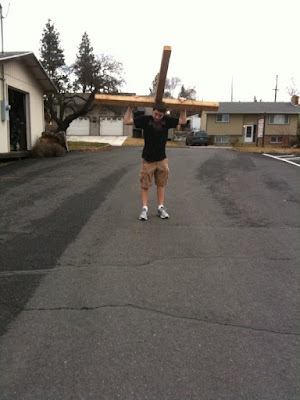 The trouble is that many people today say “Yes, I get Jesus. You Christians, though. Not so much.” In the modern world people were looking for the most right truth claim they could find (or institution holding such a truth claim) to stake their life on. Post modern people really aren’t looking to buy into the big plan. We’ve seen GM go down the tubes with our grandparents pension plans. And so too the church, leaving our grandparents (and us) to spiritually fend for ourselves. I’ll also agree with your claim that we Lutherans don’t have an articulated theology of mission (we haven’t really done our good homework on this one, yet) but that doesn’t imply that it is impossible. I think there is a real possibility for a very Lutheran (very confessional Lutheran) theology of mission that is richer than anything we could copy off of Melanchthon’s test while the teacher wasn’t looking. Lutheran missiology starts, where everything else does, in Baptism. God’s redeeming action and ever-present promise given to and for us even though we don’t deserve it and had nothing to do with getting it. That promise manifests itself throughout our lives in vocation–and in particular a call to love one’s neighbor in the real world. Baptismal vocation lived out fully (for example, as Jesus did) is contagious and transformative. It’s the kind of counter cultural love that makes people stop and say “Whatever those crazy Christians have got, I need that for my life too.” We’ve (Christians in general I think) have done a really poor job of living in such a way that our lives proclaim the Good News of Jesus and so we’ve had to resort to turning evangelism into tricks and gimmicks, strong arm techniques, or just plain not caring about our neighbor and ignoring the call to “make disciples”. A gospel shaped life lived together in community that organically draws others in is how the Christian movement began (I don’t remember any stories of Jesus asking “Have you accepted me as your personal Lord and Savior?”) It’s how it spread throughout the world and (even in a nominally Christian culture) I think its how Christians actually found themselves as followers of Jesus. We Lutherans actually have plenty of theology to make this work, we’ve just done a poor job of talking about it, and an even worse job of putting it into practice. But I think you are right that younger people today are hungry for just the kind of faith conversation Lutheran ways of talking about God lead to. Luther lived in “in between” times just as we did–and though the authors of the confessions and those that followed the first wave of the Reformation would eventually use them to draw distinctions rather than connections–the original impulse of the Lutheran movement was to help the Church move into a new era together. And that’s a threshold we are standing on once again. I think the Lutheran church could lead the way in this new Reformation. Will it happen through Pentecostal leaning Lutherans? Perhaps, but that’s not where I’m putting my chips. But I do think it will happen through Lutherans who reclaim the real power of the Spirit that calls us into the world that God loves. And I’m with Chris who commented above. Here we are, forgiven sinners blessed with a theology of abundant grace. We are sitting on a whole pile of what the struggling people in our neighborhoods are dying to get a hold of. And we’re refusing to share it. “When did we see you hungry, or thirsty or a stranger?” When indeed. It's slightly embarrassing to say that the last two night sleep on camp bunk bed mattresses have been some of the best night's sleep I've had in a long time (I've got little kids, though, remember?). But it's not at all embarrassing to say that the past two days of conversation have been some of the best in a long time as well. The process of sharing deep and often quite personal stories, and learning how to help one another in drawing out and crafting those stories, has been really rewarding. I feel like I know the folks in this room much better than our 48 hours together would suggest. Its exciting to me to think about where these Methodist congregations take the material we've engaged these past two days. Today's content is to get at how we go about facilitating this “Season of Practice” in our congregations, and community organizing practices lay at the heart of the “how” of this. But we spent a fair amount of time this morning debriefing what we had learned and exploring together why it is important. It's clear I'm not the only one for whom this process has been personally meaningful and others are also excited about the ways in which VoCARE practices might begin to transform their congregations and how they relate to the young people among them. And its also clear that there is more to these practices than simply a program for improving the number of pastors emerging from congregations. There is something in this process, in these stories and this way of being Church together, that could have deep and profound implications for all of our communities. I'm slightly disappointed as I leave this gathering because I know that the timing is not right for my congregation to engage this process right now, and it also seems to me that a moment has passed for our cluster of Lutheran congregations in Spokane to engage in it together either. 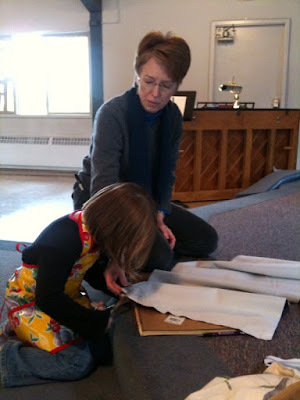 But I'm hopeful that there is some way, and some place that these Vocation Care practices can take root among Lutherans and among congregations I'm connected to. And since the training this fall I've already begun to engage in the story-telling practices, both inside and outside of my congregation. And I'm struck at the way in which this focus on call and a community that nurtures call is resonating with people outside of organized religion. When I've described this process, this curriculum, this project or just asked the sort of questions that lead to story telling with my non-church connected friends, they have gotten really excited. It seems like everyone is asking questions about call, and that the answers out there are just not cutting it. I've once again caught a vision for a transformed Church that takes vocation seriously, and becomes a community that deeply nurtures callings for all people—young and old, those inside and those outside—and releases them for the sake of the world. It's exciting to wonder about where this journey will take me next. For now it's taking me back on the ferry and then back to my parents house to pick up my little ones who (hopefully) will sleep most of the 5 ½ hours back to Spokane. It's been a great journey with the people of FTE, with my Methodist brothers and sisters, and with the Spirit into the deep question of how do we nurture call within our congregations for the sake of the world. And something tells me this journey is only beginning. We're spending much of today telling (and honing) the story of “Why we are here.” Here's a version of the story I'm telling. I first learned of The Fund for Theological Education when I was a first year student in seminary. I found out that this group (that I had never heard of) was giving out $5000 “Ministry Fellowships” to seminary students. I applied and ended up getting one. Part of the fellowship was a conference of all the recipients—young soon-to-be-pastors from all manner of denominations and from all cross the country. This was one of my first experiences of the “capital C” Church—the vast interconnected (and yet at the same time fractured) fellowship of followers of Jesus. And in the stories of my ecumenical peers I heard many of the same hopes and dreams for ministry, for leading communities of disciples of Jesus, and for the institution/communion/fellowship/body we call the Church. It was a world widening and mind opening experience for me, and one that would shape my seminary experience at the similarly ecumenical Graduate Theological Union in Berkeley, CA. That summer I spent my time (and that $5000) on a study/research/immersion experience where I toured Luther sites in Germany as I studied his life and spent time in the intentional worshiping communities of Taizé in France and Iona in Scotland. It was a journey to the roots of my faith—my Lutheran denominational roots and my spiritual roots that I traced to these two communities whose worship materials and methods were important parts of my faith journey. In my conversations with the folks from FTE it became clear to me that this organization placed a high value on young people in ministry, and were dedicated to finding ways to nurture and further that call. And they invited me into a deeper and broader Church world than I'd imagined up until that point. Thanks to FTE my experience of the Christian movement became global and ecumenical—not just in theory but in actual experience. And it's no wonder then, that years later I'd apply to FTE for funding for a project that my congregation (in conjunction with several others in our area) was embarking on to connect more deeply with younger people. Together with a colleague, I spent many hours crafting a grant proposal for FTE's “Calling Congregations” project—seeking ways to nurture vocation with young people. It turned out, however, that FTE would reject my grant proposal. But through the process I was able to get to know some of the staff who found interest in working with our cluster of congregations in a different way—on something that was just emerging from their work with congregations called “Notice, Name, and Nurture”. We'd planned a cluster training (like the one I'm attending right now) that fell through, but as soon as I caught wind of what it was that FTE was working on with this “VoCARE” concept—I knew it was something I needed to be a part of. This fall I found myself in Atlanta as a “friend of the process” with some East Coast churches being trained. And here I am, surrounded by United Methodists (our new full communion partners, I might add) learning about “Nurturing Vocating Care in Congregations.” Again I'm finding through FTE a depth, breadth, and ecumenicisity in the Church that is life giving. I'm really quite excited about the curriculum FTE has developed to help congregations embrace their callings as centers for vocation nurturing for all Christians. As a Lutheran, the theological concept of vocation is near and dear to my heart and to what it means to me to be a Christian. What is so spectacular about the material FTE has developed is how it takes this core Christian concept and gives it flesh in such a way that leaders (and whole congregations) can embrace it and put it to work in their settings—so that it can spread. And its clear that is translates across denominational lines as well. They've tapped into a particularly accessible expression of how to help congregations (and Christians in congregations) connect to the calling God has for them in the world, and to use that to live lives of deeper meaning and significance. This is potentially Church changing stuff—and if Church changing in the right ways, world changing. The methods we are learning here are not particularly ground breaking. All of this is really rooted in simple story-telling and story-listening. The stories revolve around some variation of “Tell me about a time when you felt like what you were doing was what you were meant to be doing” or “Why do you care about nurturing call with young people?” It's a process that simply leads a congregation into being an intergenerational place of story sharing, story valuing, and story living. But as those of us who have been through the immersion-style training will tell you, once you get at these really powerful stories of faith in our lives—and once you experience others deeply listening to your most sacred stories—something powerful happens. Community is built. Faith is deepened. Vocation is nurtured. Christ is encountered in the other. And it challenges the heck out of folks like me, a leader of a Christian faith community who has spent years reflecting on and developing my own sense of vocation and purpose in the world, because it calls us to take really seriously the callings of ALL of our people, and especially the young people and to take seriously the call of Christian congregations to be the place where this sort of thing happens naturally all the time. What is so exciting to me about this is that this sort of process gets at the very questions that my generation is asking—deep questions about meaning and purpose and finding ones place in the universe. And the fact that the Church might just well have the resources to help a generation (all the generations really) get in touch with who they are and what they are called to be about in the world—we'll that's just plain thrilling. Could a generation who has largely written off the institution of the Church as irrelevant (or worse) find meaning and purpose through deep intergenerational communities of Christian faith and practice? I think so, and I think these VoCARE practices are a really straightforward way to get closer to that way of being the Church in the world. I've been asked by the staff of The Fund for Theological Education to blog my expereince of the Notice Name and Nurture “VoCARE” training here at Camp Indianola on Whidbey Island in Washington State. Let me say first, I'm a bit of an anomaly here. First, because I'm a Lutheran surrounded by Methodists. And second because I'm here not in the same capacity of the other participants—who are being trained to lead VoCARE practices in their congregations. I'm here instead because I'm interested in helping put together a similar training among Lutherans. And, this is my second time through this sort of training (that time as an interloper too). But key to this VoCARE training is narrative, so I'm going to start with the story of today instead of continuing these preliminaries. I woke up this morning in Spokane, WA, which, according to Google is 315 miles from “Camp Indianola” where the retreat/training is being held. My morning began with loading up my children in the car so that I could drop them off with their grandparents who live somewhat near the camp. It pretty quickly became apparent that this little adventure might not go through as planned, when my father called at 7am with the announcement that he had spiked a serious fever in the night and might not be able to watch the kids after all. Telling a 4 year old that the trip to grandma and grandpa's is off just minutes before departure is pretty much the makings of a disaster, so we decided to make the journey even if it meant just staying and helping take care of grandpa. Then while loading the luggage, my two year old managed to find the Children's Motrin in the suitcase I wasn't loading, get through the “childproof” cap (HA! ), and pour herself several doses all in the 45 seconds I was outside. One call to poison control later (unlike me, they were reassuringly not very concerned) and we were on our way—5 and a half hours to my parents to drop off the kids, another 30 to the ferry dock—where I missed the ferry I'd meant to get on and so would be late to arrive. Now I generally use my kids as an excuse for my lateness (and more often than not they are a major factor in it) but the truth is the reason I was late for my ferry (and the conference) was on account of a choice I made. When I got to my parents house and got my kids situated for their visit, my dad pulled out a beat up manila envelope full of old photos he'd found somewhere or other, and began to show them to my four year old and telling the stories of “When grandpa was your age.” And though I knew I'd likely be late because of it, I could not pass up a moment that had the possibility of being a holy one (as it turned out to be). And so the three of us sat there, three generations, looking at photos I had never seen, and hearing stories I'd never heard. It seemed forced to leave an intergenerational story telling session to go to a conference about facilitating intergenerational story telling sessions and so I lingered. And it warms my heart to know that my daughter and her grandpa continued with the photos and stories after I left. 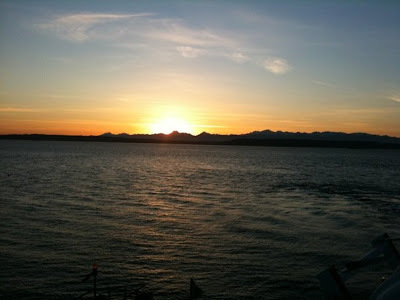 I made it to the ferry, and, as if it were a heavenly voice saying “You have done the right thing for this time and place” I was blessed with the kind of sunset that only happens over the Puget Sound—gazing across the water as the sun sinks slowly over the Olympics bathing everything around in amazing shades of blue, purple, and pink. And suddenly the day's somewhat arduous journey melted into a glorious evening prayer painted across the sky. I breathed it in, a 360 panorama of God's clear presence in the world, got back in my car when we landed and drove down a strange and winding road to arrive at the place where I had been called to go. I tell you this story for two reasons. First, good pilgrimage stories go something like this one—and the journey to the destination is a key part of the experience. And second, I tell you this story to make you wonder why I would trek 300 miles with two preschool children, and continue onward despite many reasons to just call with my regrets and stay at home (or at least at my folks' house). The choices I've made today reveal something about what is important to me—and are connected to why I'm interested in the work of The Fund for Theological Education and their Calling Congregations initiative. For the season of Lent my congregation is experimenting with some bold (for us) worship styles and have begun transforming our worship space to get ready for them. 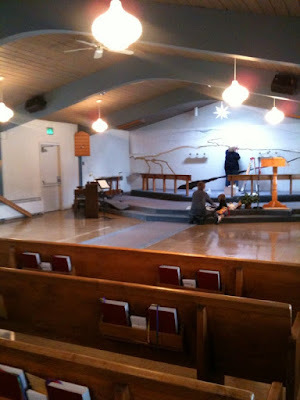 We're moving the altar down to the middle of the floor, which means we needed to get the pews out of the way. We're putting the first 6 rows on either side in storage and have replaced them with chairs so we can be semi "in the round" around the table where the Bible, communion elements, and the Baptismal font will be centered. The idea is that we are journeying in the wilderness, but God remains at the center. Up where the altar used to stand is a 3D art piece. A gravel path starts on the floor and then goes back into the wall and over the mountains in the background. 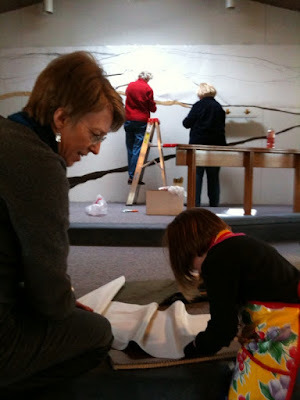 Rocks and trees and tumbleweeds help give that "desert journey" effect for our theme--which follows the lectionary readings for the season of Lent. Each week we'll add a bit to the art through some creative interactive things. We're experimenting with more "emergent" forms of interactive experiential worship while keeping the base form of the liturgy . We are also really trying to do what many emergent churches haven't done, which is to find a way of worshiping that is truly intergenerational. 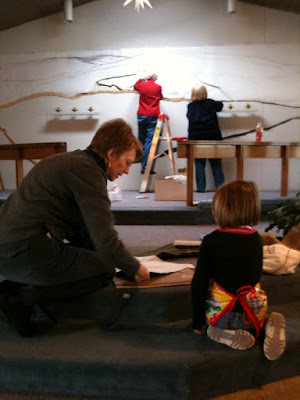 Four generations are doing the planning (with a mind for our littlest ones too) and 5 generations are participating in the creating of the space. Here's some photos, and a longer explanation is below. Emma got to cut out little trees. She thought this was the best thing ever. The path begins to emerge over the hills. 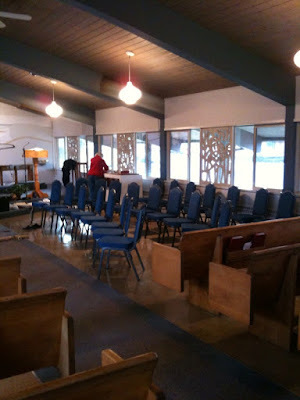 The front rows of pews are in storage. One of the questions our worship team has been has been asking for quite a while is “What will Lutheran liturgical worship look like a generation from now?” Lutheran scholars and teachers of worship and liturgy teach that worship is more than simply repeating a particular ancient pattern, but all that we do and say (in worship particularly) is meant to proclaim Christ. Worship is meant not only for us to passively receive Good News for ourselves, but to engage a community of faith in our calling to proclaiming Christ in word and deed in the world. Our worship team believes that Lutheran liturgy in the future will emphasize creativity, flexibility, and interactivity—while staying connected to the liturgical patterns that have helped the people of God encounter Christ in worship for nearly 2000 years. As part of this new commitment to becoming the “leading edge” of the Lutheran church, we will be beginning to experiment with some new ways of proclaiming Christ in worship. Our worship gatherings in Lent will continue to follow the basic four part pattern of ancient liturgy: Gathering, Word, Meal, Sending. Within each section will be something to ground us, to keep us centered, to bear the wisdom of tradition into our lives today. In the Gathering we will gather as Christians have for nearly 2000 years “In the name of the Father, and of the Son, and of the Holy Spirit” and we will sing a hymn from our list of “Old Favorites” to remind us that we carry with us the faith that has brought us this far on our journey. During the Word we will hear the ancient texts of the Scripture proclaimed and we will confess our faith as Christians have for nearly 2000 years with the Apostles Creed. During the Meal as Christians have done for nearly 2000 years we will proclaim Christ in, with, and under the bread and the wine with the words of institution Jesus spoke at the last supper (“In the night in which he was betrayed…”) and will pray together the prayer he taught his disciples, which we call the Lord’s Prayer. And during the sending we will receive the blessing that God’s people have received since the wanderings in the dessert (“The Lord bless you and keep you…”) and will be sent forth as Christians have for nearly 2000 years, to embody the Good News of Jesus in the world. In and among this framework we will be experimenting with some different and creative ways to embody and proclaim the message God has for us through these 5 weeks. 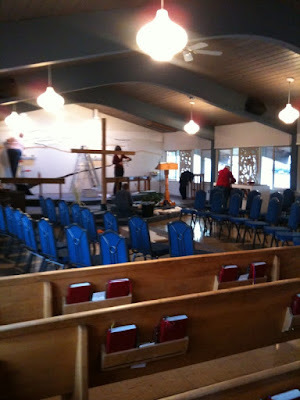 The first several sections of pews will be removed and the altar table brought into the middle of the sanctuary as a symbol of the disruption and discomfort that comes as we may a new journey into the unknown of the wilderness. And yet, on this table now at the center of our gathering, the Bible, the baptismal font, and the bread and wine of the Lord’s Supper will remind us of God’s presence in the midst of our wanderings. Around the altar table we will gather in chairs facing one another, to remind us that we are not on this journey alone. During the Gathering section we will speak together about the journey we are on through a responsive litany. During the Word we will encounter God through our neighbor as we interact in various ways with one another. During the Meal we will participate in the proclamation in various ways with symbolic actions and movements. During the Sending we will be sent forth in a number of creative ways with the charge to not let the encounter with God end as we leave our gathering place, but to carry it with us into the rest of the world and into the rest of our lives.